I know it’s January so everyone’s sticking to their New Year’s resolutions as though their lives depended on it, but let’s talk about pizza for a quick second. What’s better than pizza? Ponder the question for a moment and the answer should come to you straight away. Two pizzas! Obviously, two pizzas are better than one. Or are they? Course they are. But what if they aren’t? They are, stop stressing about it. Buuuuut… what if it’s all a lie and maths proves that one 18-inch pizza has more ‘pizza’ than two 12-inch ones? Gulp. Because that’s exactly what an academic Twitter account is arguing, with the mathematical equations to prove it. 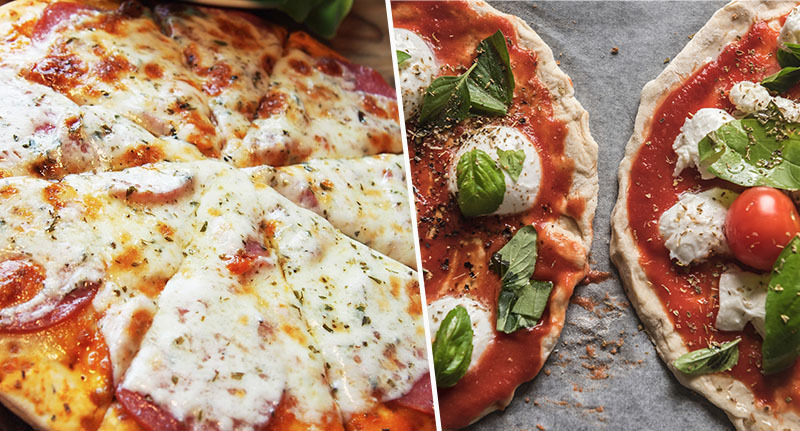 Fermat’s Library, which describes itself as ‘a platform for illuminating academic papers’, posted a picture of the three pizzas – two smaller than the other – with some (slightly complicated) workings out underneath them. Now, I’m not going to lie to you and pretend that I know what the equations mean in the slightest, but it’s something to do with Pi and inches squared. So there ya go. In layman’s terms, if we ignore the majority of the equation and just skip straight to the results, one 18-inch pizza equates to 254 inches squared whereas two 12-inch pizzas equate to only 226 inches squared of pizza. So there’s more pizza in the one larger pizza than the two smaller ones put together. Mind = blown. I’ll be honest with you, I still don’t understand it and I’ve been writing this article for the best part of an hour. But how does it work? 12 inches plus 12 inches is 24 inches, which is bigger than 18 inches and so surely there’s more pizza in the two smaller ones?! My brain hurts. Even though I have no clue how they worked it out, I’m gonna put my trust in them because – let’s face it – they have a better grasp of maths than me, an English graduate with no interest in maths whatsoever. So if you’re sharing a pizza with your other half or having a pizza party in the near future, be sure to bear this in mind because I don’t want you missing out on valuable food. Thank me later. Obviously, this revelation has caused varying reactions across the Twittersphere: confusion, panic, and pure disbelief were just a few of those exhibited by people. I just inflicted this on my friend. She didn’t believe me, she did the math, then she let out the most straight-from-the-soul “Ｎｏ” that I’ve ever heard. Well, I don’t know about you lot but I’m feeling slightly peckish now and really craving a pizza.